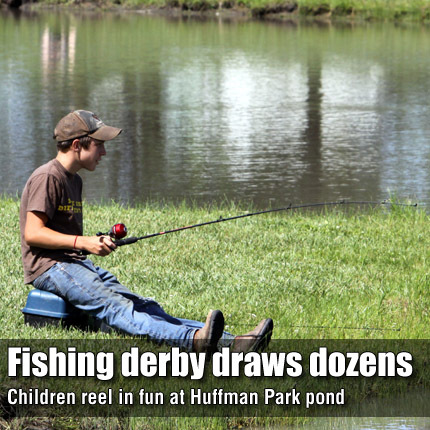 Approximately 25 children were spread around the fishing pond at the Conrad Carlson and Osage City Lions Club fishing Derby Saturday at Huffman Park. OSAGE CITY—Saturday’s fishing derby had plenty of summer activities to compete with, but still drew in plenty of participants. “We had about 25 entries,” said Butch Carlson of the Conrad Carlson Foundation, which co-sponsored the event with the Osage City Lions Club. Prizes were awarded to the child who caught the biggest fish in each age category. The remaining fish were added together by length, with the longest length placing first through seventh in overall competition, excluding those who won biggest fish prizes. “We tried to set it up so that everyone who caught a fish got a prize,” Carlson said.